Here are a couple cards I made using my favorite cardstock for coloring with Copic markers. The Classic Crest #80 cardstock in Solar White is one that Marianne Walker, the guru of Copic markers, recommends. My favorite ink to use for stamping and coloring images using the Neenah paper and Copic markers is Memento ink in Tuxedo Black or Rich Cocoa, depending on the color scheme you're planning to go with. 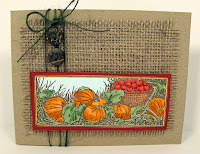 For the pumpkin harvest card I used the Rich Cocoa ink because it complemented the burlap fabric panel and rustic button embellishment underneath the image. 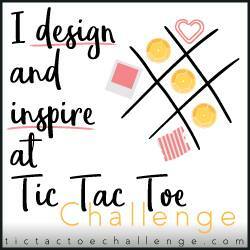 It also made the basket a cinch to color! You'll notice that the back of the cardstock shows lots of color bleeding, even though the front of the image looks sharp and clear. This is a sign that you've chosen the right paper and stamping ink for Copic coloring! After coloring the image I mounted it onto a slightly larger piece of Stardream Metallic cardstock in Mars (maroon). I first roughed the edges of this maroon cardstock by scraping the inside of my scissors blade along the edges. This was then mounted with foam tape onto the card front after I added the frayed burlap piece, the green jute twine and rustic wood buttons. 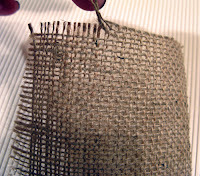 I picked up the burlap a while ago at my upholsterer's shop and have been waiting to use it on just the right project. 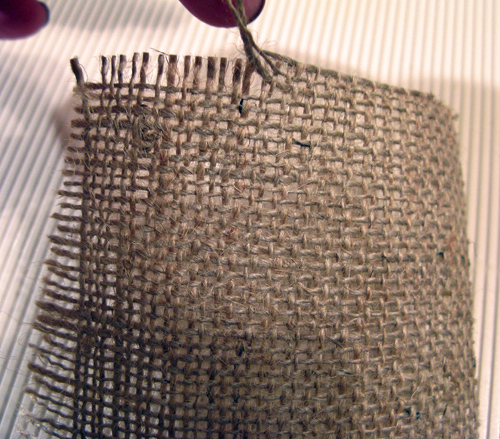 To get the frayed edges I simply cut the burlap a little larger than my card front and then pulled out a couple strands of the fiber. Nice touch, huh? 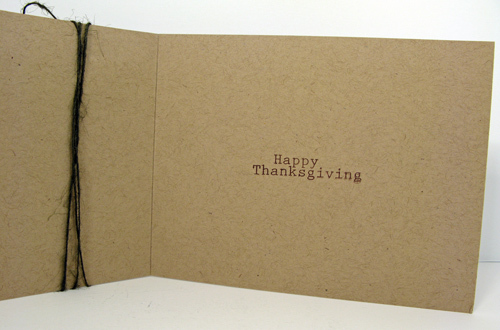 Finally, the inside of the card is simple -- Happy Thanksgiving -- in a clean, typewritten font. 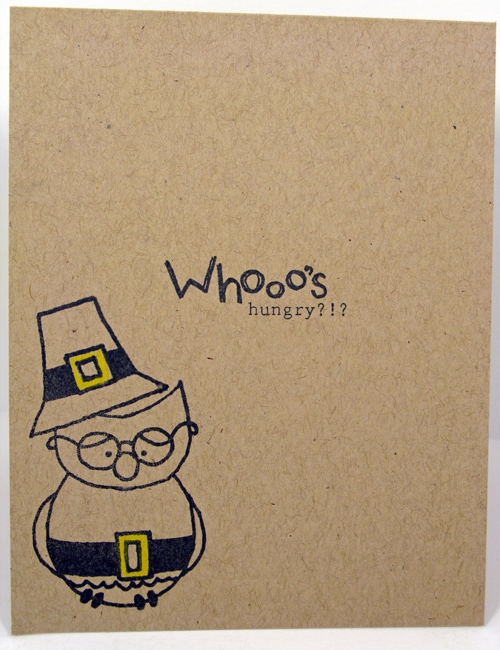 This is one of many images from Sweet Stamp Shop's newest set called "Thanksgiving Owl-fits". I really like this set and used it again in my next card. 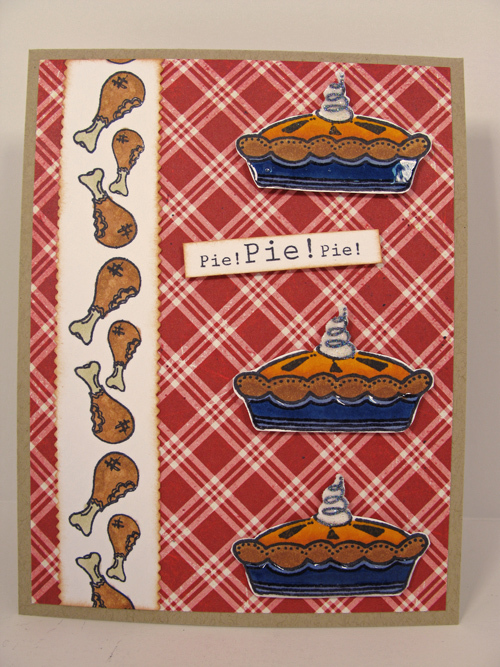 I may have been slightly hungry when I created this next card...and with Thanksgiving on it's way I'm sure lots of us are beginning to dream of yummy pumpkin pie! 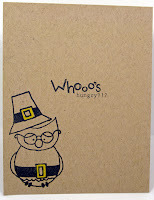 Thanksgiving Owl-fits has the cutest darned images to fill the bill for this card and many, many more to come. The turkey drumstick border was stamped in Tuxedo Black Memento ink and then colored with a couple different Copic colors. I then used the Blender Pen to pull out some of the color, giving the drumsticks a textured look (kinda' like a crispy baked skin!) I used small pinking shears to trim the border and then dabbed on Distress Ink in Tea Dye along the edges. The sentiment "Pie! Pie! Pie!" was perfect to plop into the trio of whipped cream topped pumpkin pies. Of course, the pie image itself could easily be transformed into any other kind of pie you desire, warm and steamy from the oven! I used Glossy Accents on the pie pan so it would look like a ceramic pie dish and glitter on the whipped cream for a bit o' sparkly yumminess. 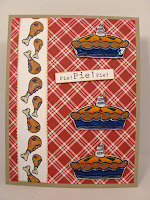 Each of the three pie images was mounted with foam tape to give the card front some dimension. Finally, I finished the inside with a pilgrim owl with golden buckles on his hat and belt and the sentiment "Whoo's hungry?" Start making that shopping list...you're gonna want lots of stuffing, mashed potatoes, and big ol' Butterball!